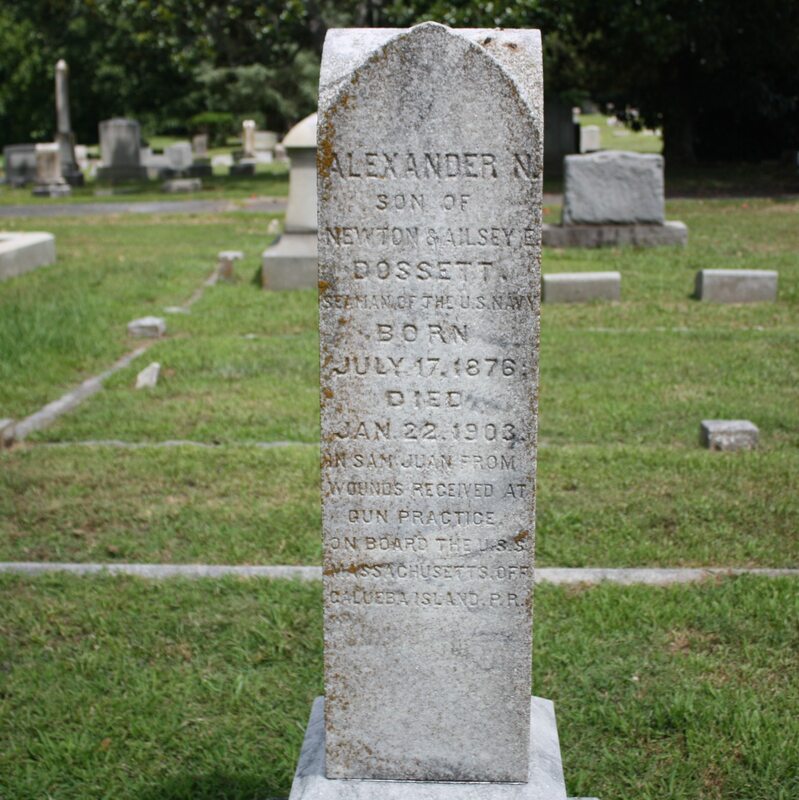 Alexander N. Dossett was a 26-year-old seaman in the United States Navy when he sustained fatal burns from a powder explosion during target practice aboard the U.S.S. Massachusetts. He was buried in Durham, North Carolina’s Old Maplewood Cemetery. Below the photos is a newspaper article from 1903 describing the accident and listing other casualties. The explosion occurred on January 16 and Alexander died January 22, so when the article was published he was still alive. 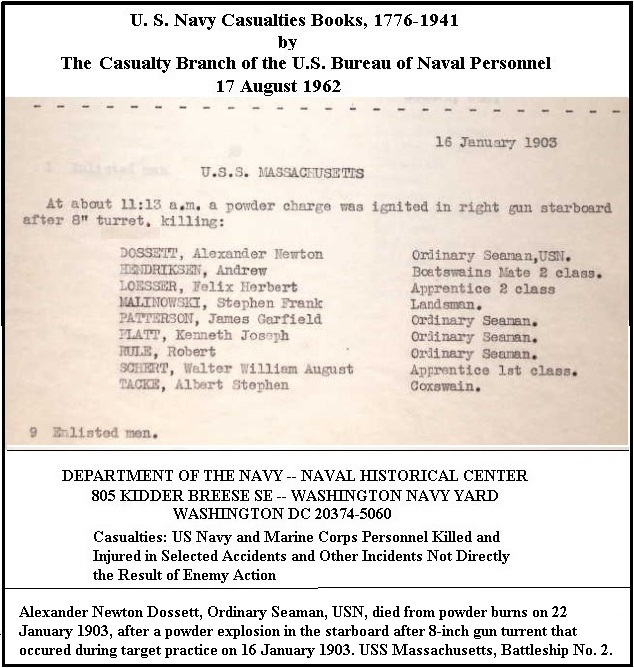 San Juan, P. R., Jan. 17—Five men were killed and four others were wounded, two of them probably fatally, by the explosion of a powder charge of an S-inch gun on board the United States battleship Massachusetts, yesterday morning, while at target practice, off Culebra island. Details of the explosion were obtained when the Massachusetts arrived here today. The explosion occurred in the starboard aft 8-inch turret shortly before noon yesterday, and was due to the accidental discharge of a percussion primer while the breech of the gun was open. The full charge exploded in the turret and killed or injured all the crew of the gun, numbering nine men. Ensign Ward E. Wortman, who was in charge of the turret, escaped injury, though he was standing near the scene of the explosion. Magnificent discipline was shown by officers and crew. Capt. Harry Lee, commanding the marine guard of the vtsrel, and Ensign Clarence Abele immediately Hooded the turret with water, and Lieut, Charles E. Hughes and Gunner Kuhlweit went below to the magazine, picking up powder charges, and prevented further explosions, while Lieut. William C. Cole and Gun Capt. Stoneman entered the turret and withdrew the charge from the other gun, whose breech was open. The survivors of the gun’s crew, when rescued, were burned, mutilated and nearly dead. San Juan, P. R.. Jan. 17, 1903.—Secretary Navy, Washington, D. C.: Powder charge exploded accidentally in 8-inch turret Massachusetts. Cause being investigated b yboard. Dead. A. Hendricksen, boatswain’s mate; F. H. Lesser, apprentice; S. F. Malinowski, landsman: K. J. Platt, ordinary seaman: Robert Rule, ordinary seaman. Injured: W. W. A. Schert, apprentice; A. S. Tacke, coxswain: J. G. Patterson, ordinary seaman; A. N. Dorssett, ordinary seaman. i 12, 1882; residence, Mt. 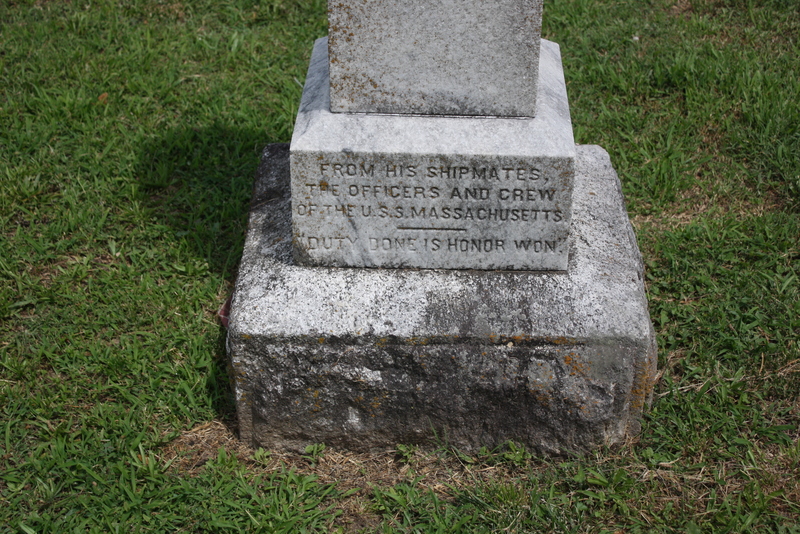 Washington, Ohio; next of kin, John A. Rule (father), Mt. Washington, Hamilton county, Ohio.